When you step into your shower, you expect to emerge fresh and clean. But where does all that soapy body soil and dirt go? Much of it lands on the surfaces in your shower where it can attract mildew spores, bacteria, and even more grime. It's time to get your shower really clean. A shower should be thoroughly cleaned weekly. However, if you do 60 seconds of maintenance each time you use the shower, you may be able to stretch the more extensive cleaning to two weeks. Shower curtains should be washed at least seasonally or more often as needed. After every shower, use a squeegee or a bath towel to wipe down the shower walls and doors. Hang any shower tools like brushes or poofs to drip dry completely and clear the drain of any excessive hair. This quick routine will keep ceramic tile, fiberglass, and stone shower enclosures looking their best and make the weekly cleaning much easier. The biggest challenge with ceramic tile showers is the grout, especially if it is left unsealed. The porous nature of the grout makes it the perfect growth medium for mildew spores. The shower will be much easier to clean if you remove all of the shampoo bottles, soap, razors, poofs, and toys. Combine products and recycle any empty bottles. Wipe down each item with a cloth dipped in hot water to remove any sticky messes. Remove any excessive hair from the drain. To help ventilate any fumes from cleaning supplies and to help the shower dry quickly, turn on the bathroom fan, open the bathroom door, and any windows. Use the shower head or a bucket to wet down the walls of the shower. If you see the presence of mildew on the grout, tackle it first before you move on the usual grime. Mix a solution of one part chlorine bleach and two parts water. 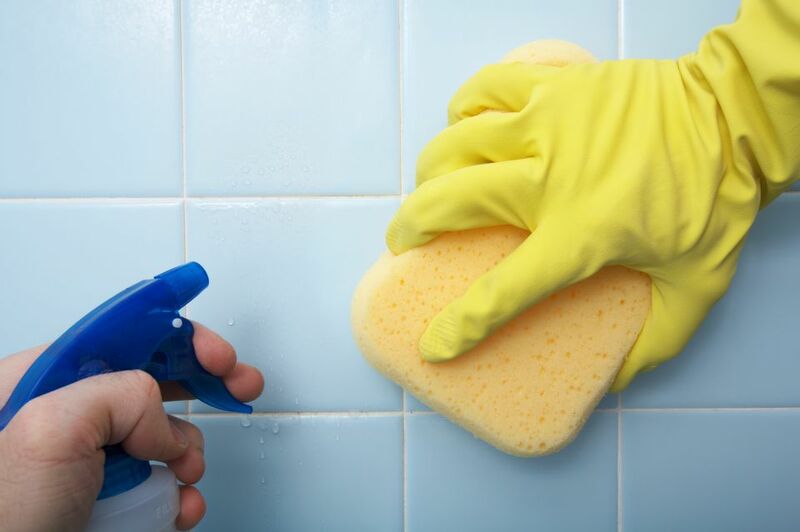 While wearing rubber gloves, apply the solution to the mildewed grout with a sponge. Allow it to work for at least ten minutes and then scrub the grout with a soft-bristled brush or old toothbrush. Rinse the area well with hot water before moving to the next step. Never mix cleaning solutions like chlorine bleach and ammonia that can cause toxic fumes. Whether you are using a commercial cleaner or a homemade solution, the key to easier cleaning is to give the product time to do its job. Spray the cleaner on the walls and floor of the shower and step away for at least five minutes—10 minutes is even better. The cleaner will begin to break apart the soap scum and soil and lessen your need to scrub. Use a sponge or plastic mesh scrubber to clean every section of the walls and floor. Never use a metal scrubber or hard-bristled brush because they can scratch the ceramic tile. Rinse the walls with clean water starting at the top and moving down. Use a squeegee or old towels to remove any water from every surface. Skipping this step will result in water spots. Fiberglass shower enclosures are durable and easy to clean if you use the right tools and products. It is very important to never use anything that will scratch the fiberglass surface. When scratches occur, soil settles into the area making it harder to clean. After removing all of the bottles and accessories in the shower, spray the walls and floor with distilled white vinegar. Use a squeegee to wipe down the walls. The vinegar will cut through soap scum and any minerals in water spots. Fiberglass floors are usually textured and need a bit of scrubbing to remove grime. Sprinkle the vinegar-dampened floor with baking soda or borax and allow it to work for at least 10 minutes. Use a sponge or soft-bristled brush to scrub away the dirt and rinse with plain water. Once your fiberglass shower stall is sparkling clean, you can use fiberglass boat wax to provide a protective coating on the walls that allows water to run right off without spotting. However, never use the wax on the floor because it leaves a slippery finish. If you have upgraded to marble, granite, or another natural stone as a finish, your shower must be cleaned a bit differently. By wiping down the walls after every use, you should only need to clean the stone once a week. Never use vinegar or harsh cleaners on natural stone because they can etch the surface. After emptying the shower of all loose items, spray down the walls with the commercial stone cleaner or a solution of one tablespoon dishwashing soap in one quart of warm water. Wipe down with a microfiber cloth. Use a bit of extra elbow grease on any water spots and soap scum. Rinse with clean water and dry with a microfiber cloth starting at the top of the shower and working to the bottom to avoid streaking. If you spot any mildew on the stone or grout, mix a solution of one part chlorine bleach and one part water. While wearing rubber gloves, dip a sponge into the mixture and apply to the mildewed area. You can use a toothbrush to reach smaller grout areas. Let the solution work for fifteen minutes, scrub lightly with a soft-bristled brush, and then rinse away with plain water. Following your installer's guidelines, natural stone needs a barrier to prevent chemicals and water from penetrating into the stone. Sealing also prevents bacteria from settling into the natural crevices of the stone's surface. After the stone is completely clean and dry, apply the stone sealer in small sections following product directions and buff with a soft cloth until all of the sealer is absorbed. This usually needs to be done at least twice a year. There are a few stains that seem almost impossible to remove, but there is a way. If you've had stickers on the shower floor or a removable accessory left some goo, use a bit of olive oil to saturate the area. Let it work for at least 15 minutes and then use a plastic scraper or the edge of a credit card to remove the goo. If a bit is left, some rubbing alcohol on a cotton ball or swab will remove the rest.